Wormholes turned white - help me recover this finish! 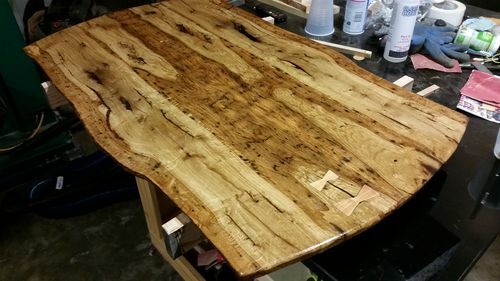 I made this tabletop from wormy oak that I milled and kiln dried. Finish is System 3 Clear Coat epoxy. SWMBO likes it, but says it’s too shiny. So I took the shine off by sanding with 400, 800, 1200. This created a lot of white dust, which collected into the wormholes (which didn’t fill with epoxy). Now I can’t get the dust out of the holes! Won’t blow out with compressed air; I’ve tried brushing out with a toothbrush, but it’s a lot of work for each hole and there are hundreds of them; plus it seems the brush was getting most, but not all, of the white powder out. To make matters worse, I had used some BLO to lubricate the last round of sanding, and I’m starting to think it has coagulated the remaining dust into the holes – I left it for a few days, and now even brushing won’t take the white out. What do you LJocks recommend? Option 1: mix some black tinted epoxy, and using a toothpick, drop a bit into each hole. Then, quickly, wipe the top aggressively with a Xylene-soaked rag to pick up any excess black epoxy. The black probably won’t fill the holes completely, but will (hopefully) cover the white; and wiping it off will prevent having to sand again and recreate the problem. Option 2: Liberally apply shellac. 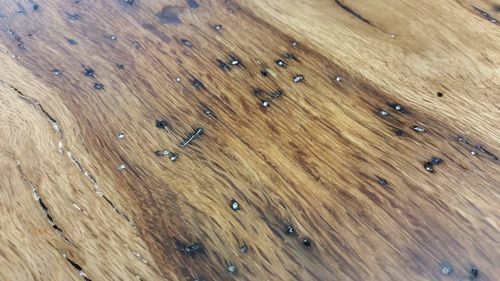 Hoping that the shellac flows into the holes and suspends the powder particles, making them clear; then wipe the top off with denatured (avoiding the shine that SWMBO doesn’t like). Option 4: any ideas you folks have? Do you have an hidden area or cutoff you can test? I think filling it with a dark resin will look the best, but kind of a gamble as to if it will stain the wood or not at this stage. Cerusing with a dark wax also could work well, but I don’t know how it will work out with BLO as an undercoat. All else fails you could try clearing the residue out with a brass brush. Be a lot of work and you will need to top coat it with something to get rid of the scratched, but that is a big piece not to ultimately be happy with. Good luck and let us know what worked for you. 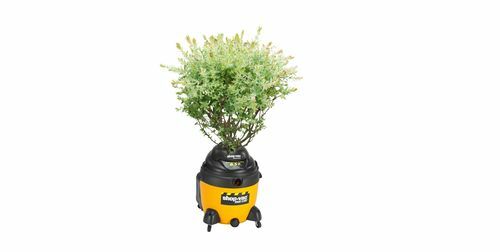 Have you tried a bush on a shop vac? I had a similar problem, at least i think its similar, with a cupboard that was painted white. It took me two nights to clean them, using a needle and a vacuum cleaner. Needless to say, it was a heck of a job, but finally it made me happy. I would see what a brush with paint thinner (mineral spirits) does. Then blow it out with air while it’s wet. The BLO may have sealed in the sanding dust. If that’s the case, filling with black epoxy may be the only other way to go, without stripping it out.. The blo most likely sealed a significant amount in the holes – wrong choice. I’ve had the same issue many times. A brush on a shop vac and microfiber towels help but usually dont get it all. 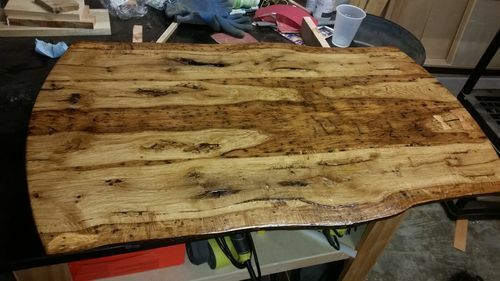 I thin paste wax down till watery and add dark dye – depends on the project color – pretty much flood the surface so the wax mix gets in all the holes, then wipe The surface down to get an even wax coating. You can also wipe the surface with a damp ms rag to strip the wax but leave it in the holes. Typical ob stains have pigment and dye. In a can that has sat for a few days the pigment settles out. The liquid on top has dye in it and can be mixed with the wax. Just have to find the right color. I would see what a brush with paint thinner (mineral spirits) does. Then blow it out with air while it s wet. If that s the case, filling with black epoxy may be the only other way to go, without stripping it out.. It would be better if the bush had white petals. Sorry for the misspelling it’s a bad migraine day. What I had invisioned was the shop vac with a small stiff detail brush attached. If I feel up to going out to the shop I will take a picture of the one I have well if I can find it. It’s a mess out there right now. It would be better if the bush had white petals. Sorry for the misspelling it s a bad migraine day. What I had invisioned was the shop vac with a small stiff detail brush attached. If I feel up to going out to the shop I will take a picture of the one I have well if I can find it. It s a mess out there right now. I was just funnin with ya. I misspell words all the time…. If the mineral spirits doesn’t work, try acetone using something like a Q-tip. Acetone is a solvent for epoxy and may dissolve the dust. Then again, it may not :) Best of luck. Thanks everyone. Looking hard at these suggestions, I’m trying to lay out an order in which to try things, starting with the most reversible. First would be shopvac, with stiff brush (I have tried, but perhaps need to try more), with needle (I’ve been using a sharpened piece of wire but a needle is a good idea). Next would be brushing with MS. If that fails, next would be dabbing acetone into the pores. So far, all the above are aimed at REMOVING the dust. Oh, and if any of that leaves scratches, sanding to remove them is out of the question – so that’s a problem! So I think if this fails, I’ll next try the shellac method (which nobody seconded!) since it’s reversible. If it can suspend the particles, making them clear, my problem would be solved. Then it’s either wax or black epoxy. Epoxy being irreversible, and wax being difficult to reverse. I’m concerned that wax would be pretty dull… but if there are unintended consequences with the epoxy I’d be in trouble. I hate the idea of letting this gorgeous peice get ruined. And I hate the idea of having to put much more labor into this – I’ve already put a LOT into it. Anyway thanks for the advice all, I’ll try to let you know how it goes! and keep it coming if anyone has more suggestions! Technically, this is your wife’s fault. I’d make her do the work. I tried brushing aggressively with a toothbrush and MS (no shopvac, I truly don’t believe it would have helped). Once the MS evaporated, the situation was a bit better, but the problem persisted. Those holes are so deep and narrow that the contaminants do not want to evacuate. A high-pressure spray of MS through a narrow nozzle would work, maybe, but I don’t have such equipment. Compressed air does not get it. I also tried dissolving the particulate with Xylene – sounds like a great idea, but no, once the Xylene evaporates, the deposits remain. Two options, I guess: a) brush with MS for one more round, then be satisfied with the result and accept the imperfection; b) try dripping black epoxy into the whitest holes. I think I’ll try b on a few tonight. Will update if anything works. Oh – and I looked at car clay, but I don’t think it works in this application because the holes are so deep and narrow, the clay would not reach the contaminates. I would try the shellac on a small area and see if it works, I know it works on lacquer and poly. Forgot to mention – I tried that too. No use! 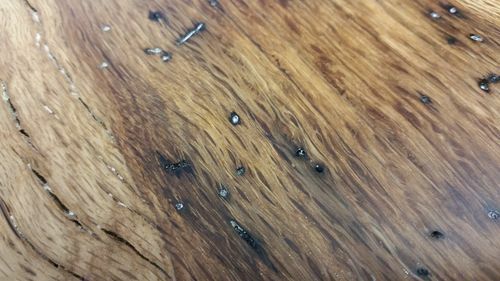 I think the epoxy powder, combined with my foolish attempted solution using BLO, is congealed well enough that the shellac couldn’t flow into it and suspend the particulates.